9/11 warnings: not a surprise attack nor intelligence "failure"
not a surprise attack nor an "intelligence failure"
"The attack will be spectacular and designed to inflict mass casualties against U.S. facilities or interests. Attack preparations have been made. Attack will occur with little or no warning." An article sheds new light on the CIA's desperate efforts to warn about 9/11. Why didn't the White House listen? Last year Jonathan Kay, a Canadian journalist, published "Among the Truthers," an interesting chronicle of, among other things, post-9/11 conspiracy theories. Many of these theories are outlandish on their face, such as claims that the twin towers were brought down by controlled demolition, that airplanes never struck them, that Flight 93 landed in Cleveland rather than crashing in a Pennsylvania field, and so forth. Now if I were inclined toward a conspiratorial view of the world, I would speculate that the very outlandishness of these claims is itself part of a conspiracy to obscure what really happened on 9/11. This meta-conspiracy theory would go something like this: Over the past 11 years, it has slowly but inexorably become clear that the CIA uncovered key details of the 9/11 plot several months in advance, and tried on numerous occasions to get the Bush administration to take action to stop it. In a New York Times Op-Ed, http://www.nytimes.com/2012/09/11/opinion/the-bush-white-house-was-deaf-to-9-11-warnings.html Kurt Eichenwald offers new evidence on this front. Throughout the spring and summer of 2001, Eichenwald claims the CIA presented the administration with compelling evidence that al-Qaida operatives were in the United States, that they were planning a major terrorist attack intended to produce mass casualties, and that this attack was imminent. In response, the Bush administration did nothing. "Officials at the Counterterrorism Center of the C.I.A. grew apoplectic. On July 9, at a meeting of the counterterrorism group, one official suggested that the staff put in for a transfer so that somebody else would be responsible when the attack took place, two people who were there told me in interviews. The suggestion was batted down, they said, because there would be no time to train anyone else." For a long time, the administration successfully covered up this series of events, by employing the clever strategy of revealing a small and ultimately misleading part of the truth: In April 2004, it declassified a single daily briefing, that featured the startling headline "Bin Laden Determined to Strike in U.S.," but on closer examination did not contain much in the way of specifics regarding the attack, which took place just 35 days after the memo's printing. Note that to this point my meta-conspiracy narrative has the unusual virtue of being based on nothing but what are now the known facts of the matter. To go beyond this, we have to enter the realm of speculation, which is where things get "conspiratorial" in the dismissive sense of the word. We might, for example, speculate that certain neoconservatives in and around the White House were not wholly displeased with the failure to stop the attacks, since they provided an emotionally compelling, although completely irrational, basis for launching the invasion of Iraq these people were laboring to bring about. Now, do I believe in this meta-conspiracy theory? Of course not, because I am – or at least aspire to be – a Very Serious Person, and Very Serious People do not believe in conspiracies. They do, however, participate in them. is a subtle insertion of anti-semitism into the 9/11 truth movement and is an example of government propagandists using racists to smear government critics. Vague conspiracy theories blaming Israel began to appear within 24 hours of the attacks. Syria's government-owned Al Thawra newspaper may have been the first newspaper to make the "4,000 Jews" claim. According to U.S. embassy reporting, its September 15th edition falsely claimed "four thousand Jews were absent from their work on the day of the explosions." The 4,000 figure apparently came from an article entitled "Hundreds of Israelis missing in WTC attack" which appeared in the September 12th internet edition of the Jerusalem Post. It stated, "The Foreign Ministry in Jerusalem has so far received the names of 4,000 Israelis believed to have been in the areas of the World Trade Center and the Pentagon at the time of the attacks." Unknown conspiracy theorists apparently seized upon the 4,000 figure, transforming it into the false claim that 4,000 Jews did not report for work at the World Trade Center on September 11. Irving, like several other Holocaust deniers, has published information about 9/11 complicity that might be true, but is unverifiable. He published a claim that Condolezza Rice was the source who warned then San Francisco Mayor Willie Brown not to fly on 9/11 (the September 12, 2001 San Francisco Chronicle published a story noting that Brown had been cautioned the night before not to fly to New York City on 9/11, but Brown has never revealed who warned him). It is plausible that Rice was his source (she probably knew him from her tenure at Stanford and had been on the board of San Francisco based Chevron corporation), but it is unlikely that proof will ever be made public. If Rice really was Brown’s source, then leaking the truth to a famous racist would be a great means to discredit the information. From the Wilderness editor Jamey Hecht wrote in a public letter to the Anti-Defamation League that "Those who believed the rumor think they needn't look further, and those who rejected it think the same, for opposite reasons." The "4,000 Jews" story distracted from well documented evidence of foreknowledge. Many of the US’s closest allies provided extremely specific information in advance. is an excellent reference to this material. “my nephew Jim Pierce narrowly escaped injury or possible death. He was scheduled to attend a meeting on the 102nd floor of the South Tower, which was the second building hit. However, the night before, the meeting was moved to an adjacent building because the group had outgrown the conference room. Newsweek also reported two weeks after 9/11 that “On Sept. 10.... a group of top Pentagon officials suddenly canceled travel plans for the next morning, apparently because of security concerns.” Like most suspicious evidence about 9/11 in the mainstream media, there was not ever any follow-up. The “4,000 Jews warned” story was a great false target for media attention to distract from a lot of evidence for foreknowledge (and consciously allowing it to happen). Since about one-third of New York is Jewish, having a lot of anti-semites promote information about 9/11 complicity was a brilliant technique to discourage many of the victims and bystanders from questioning the official story. Some of the websites now promoting disinformation about 9/11 complicity (fake claims that distract from real evidence) are also advocates of Holocaust Denial, which ensures that most Bush opponents will shy away from the embedded truths about 9/11 in the websites. www.oilempire.us/holocaust-denial.html discusses in detail how Holocaust Deniers are inserting disinformation into the 9/11 truth movement. One curious fact that might or might not be relevant is the towers were less than half full when attacked. Figures vary, but the WTC had between 15,000 and 25,000 people inside at 8:46 am on 9/11 -- on a normal workday at least 50,000 people worked there. However, one WTC employee that I personally know of (a low-level computer operator) merely had not yet arrived at work and saw the events from a distance. The idea that thousands in the towers would have been specifically warned makes no sense considering the perpetrators could not risk letting lots of people know what was going to happen. Warning more than a tiny handful of people would have risked exposing the operation. The fact that Barbara Olsen, wife of US Solictor Ted Olsen, was on the doomed Flight 77, suggests that very few actually were warned, and it was her bad luck to be caught up in the events. Once trapped on board, there was nothing anyone could have done to save her despite her loyalty to the regime. Her fate is reminiscent of a story from the Nazi death camp at Treblinka -- a German non-Jewish woman and her sons accidentally got on a train that took German Jews to the camp. According to survivors, she protested that she was not Jewish and her husband was a military officer. But she and her sons were killed anyway, since there was no way she could have been allowed to return to Germany with knowledge of the terrible truth. Once swept up into the system there was no way she could have escaped. "I don't believe any longer that it's a matter of connecting the dots. I think they had a veritable blueprint, and we want to know why they didn't act on it." Specter was the Warren Commission attorney who invented the ludicrous idea of the "magic bullet" to reduce the number of bullets actually fired at JFK (and therefore make it slightly plausible that Lee Harvey Oswald was the lone gunman - a view that very few citizens of the Oil Empire have, for good reason). "There were lots of warnings." "Should we have known? Yes, we should have. Could we have known? Yes, I believe we could have because of the hard targets [CIA operatives were tracking]." "For Mayor Willie Brown, the first signs that something was amiss came late Monday when he got a call from what he described as his airport security -- a full eight hours before yesterday's string of terrorist attacks -- advising him that Americans should be cautious about their air travel." The author Salman Rushdie believes that US authorities knew of an imminent terrorist strike when then banned him from taking internal flights in Canada and the US only a week before the attacks. On September 3 the Federal Aviation Authority made an emergency ruling to prevent Mr Rushdie from flying unless airlines complied with strict and costly security measures. Mr Rushdie told The Times that the airlines would not upgrade their security. The FAA told the author's publisher that US intelligence had given warning of "something out there" but failed to give any further details. 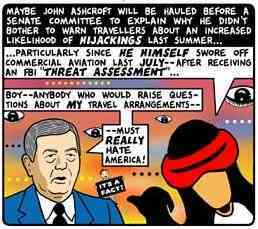 The FAA confirmed that it stepped up security measures concerning Mr Rushdie but refused to give a reason. "On Sept. 10.... a group of top Pentagon officials suddenly canceled travel plans for the next morning, apparently because of security concerns." "CounterPunch has also learned that an internal memo was sent around Goldman Sachs in Tokyo on September 10 advising all employees of a possible terrorist attack. It recommended all employees to avoid any American government buildings." 1. On September 10, a fifth-grader in a Dallas suburb told his teacher World War III would begin the next day, and the United States would lose. This occurred in a northern suburb of Dallas. Just a few days before the student's remarks, the FBI had raided InfoCom Corporation, a website hosting company for clients in the Middle East, which is located in the nearby suburb of Richardson. Across the road from InfoCom's offices is the headquarters of the Holy Land Foundation, an Islamic charitable organization which was the largest Islamic charity in the U. S. and whose chairman was a vice president of InfoCom, and which has been accused of being a sponser of Hamas terrorists in Israel (there may also have been family connections between Hamas and InfoCom). The Holy Land Foundation was subsequently shut down by the U. S. government. The FBI investigated the matter of the prescient student and dismissed it on the rather unsatisfactory grounds that the teacher later decided she could not be certain the boy had actually predicted World War III would begin on the same day as the terrorist attacks (do they think she must have imagined this story?). 2. The most famous story of foreknowledge is that of the 14-year-old student in Brooklyn, who supposedly stared out the window of his school at the WTC on September 6, and predicted that the towers would not be standing the next week. The story was investigated but the issue appears to remain a mystery and the student remains in the school. There are a few other similar stories around (see the Insight article), most of which are probably legends, but this story appears to be an example of true foreknowledge. 3. A writer for the Village Voice was in a cab driven by an Arab cab driver on July 16, 2001. The driver told her that he would be going home to Egypt sometime in late August or September, as Osama bin Laden had planned big terrorist attacks for New York and Washington for that time. She reported him on September 13, which caused him to be questioned, but not arrested, by the FBI. Over a year later she asked him about it. After initially denying that that he told her about the attacks, he admitted that he had, saying: "But many people knew this." He said it was merely common knowledge in the Arab world. There are other stories involving cab drivers not working on the morning of September 11, which are probably mostly urban legends.The common factor in these stories is an odd reluctance by the authorities to believe any of them. 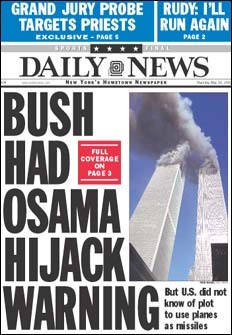 Of course, it is now very embarrassing to all American police and intelligence agencies, not to mention the Bush Administration, that knowledge of the attacks should have been so readily available, and therefore they have an interest in downplaying any stories of foreknowledge. It seems to me that there were rumors in the Arab community that were taken semi-seriously, but these rumors were never reported as people felt, no doubt correctly, that the authorities would not believe them. Schoolchildren and talkative cab drivers were the only ones who would mention them outside the community. In the wake of the massive number of arrests of young Arab men who were held unconstitutionally, often without proper legal representation, and eventually released, the Arab community will probably take future warnings much more seriously but will not dare report them to the authorities. There is a cost to racial profiling and the denial of constitutional rights. German police have confirmed an Iranian man phoned US police from his deportation cell to warn of the planned attack on the World Trade Centre. The Lower Saxony Justice Ministry has confirmed the man warned of the impending series of terrorist attacks, but had not been believed. Spokesman Frank Woesthoff said the man phoned America "several times", but refused to give further details. He said the US Secret Service had not told the ministry about the calls received from the Langenhagen prison until after the attacks. "I cannot say anything about the man and the ministry does not know the content of the conversations," he added. The Hanover daily newspaper Neue Presse reported the 29-year-old was dismissed as mentally unstable when he gave the warning of a terrorist attack to occur this week. The ministry would not reveal when the calls had been made. Over the last 13 years, I have delivered executive briefings on global security issues and led training sessions for professionals in forty countries, I have written well over a hundred security-related articles and op-ed pieces in the print media. I have an informed opinion. And there are two important points about the Bush-Cheney regime that I want to impress upon you, the first point is that this cabal is responsible for the most sweeping and significant failure of overall security policy -- both in the USA and in the world -- in modern history; the second point is that it is willful, it is not due to incompetence, it is driven by a need to turn the USA and the world upside side, just as a cosmetic surgeon would break the bones of someone's face to re-shape into a different one. It is not inconvenient truth, it is an inexcusable truth: this massive failure was not the result of bumbling, it was the result of betrayal. The most important set of established facts concerning the 9/11 attacks supercedes any and all of the unanswered questions about 9/11; and that set of facts is that the Bush-Cheney national insecurity team was warned repeatedly -- both from inside our own intelligence community and from the intelligence agencies of numerous friendly governments -- that Bin Laden was coming for us that summer. The story of FBI counterterrorism expert John P. O'Neill's last year on Earth confirms the heedlessness of this cabal. O'Neill was running the Cole investigation, he quit the Bureau in frustration because the Bush-Cheney connection to the Saudi rulers was blocking his efforts. He went to work as head of security for the WTC, and died on 9/11. As Alanis M. sings, "Isn't it ironic?" (You can learn more about O'Neill from PBS Frontline's The Man Who Knew. Further corroborative evidence of the heedlessness of the Bush-Cheney national insecurity team is available at Borders or Barnes & Nobel (or better yet, the Buzzflash store): former National Security Council official Richard A. Clarke and former CIA Director George Tenet both write of desperate attempts to get the threat from Al Qaeda moved to the top of the agenda that summer. They looked the other way, because they were looking for an opportunity to go to war in the Middle East and Central Asia (this hope is expressed wistfully in PNAC); and they were looking for an excuse to weaken the Constitution, and in particular the Bill of Rights, in an effort to turn the US federal government into a cash cow for cronies (can you say, "Halliburton"?) and a cudgel against political enemies (ala the DoJ scandal), etc.-- in short, the strategy was to control as much of the world's oil reserves as possible and to build a one-party state at home. 9/11 gave them a leg up. WASHINGTON In the months before the Sept. 11 attacks, federal aviation officials reviewed dozens of intelligence reports that warned about Osama bin Laden and Al Qaeda, some of which specifically discussed airline hijackings and suicide operations, according to a previously undisclosed report from the Sept. 11 commission. But the Federal Aviation Administration was "lulled into a false sense of security" and did not take significant actions to enhance security, despite the many warnings, the report said. "Intelligence that indicated a real and growing threat leading up to 9/11 did not stimulate significant increases in security procedures," the report found, adding that aviation officials had appeared more concerned with reducing airline congestion and delays and with airlines' financial problems than deterring a terrorist attack. The Bush administration has blocked the public release of the full, classified version of the report for more than five months, officials said, much to the frustration of members of the Sept. 11 commission who say it provides a critical understanding of the failures of civil aviation officials. The administration provided both the classified report and a declassified, 120-page version of the report to the National Archives two weeks ago and, even with heavy redactions in some areas, the declassified version provides the firmest evidence to date about the extensive warnings that aviation officials had concerning the threat of an attack on airliners and their failure to take specific steps to counter it. "The fact that the civil aviation system seems to have been lulled into a false sense of security is striking, not only because of what happened on 9/11, but also in light of the intelligence assessments, including those conducted by the FAA's own security branch, that raised alarms about the growing terrorist threat to civil aviation throughout the 1990s and into the new century," the report said. In its previous findings, including a final report last July that became a best-selling book, the Sept. 11 commission went into extensive detail on the harrowing events aboard the four flights that crashed on Sept. 11 and on the events leading up the attacks. But the new report, focusing exclusively on aviation, goes much further in revealing the scope and depth of concerns presented to federal aviation officials about the threat of a terrorist attack on an airliner. It says, for instance, that leaders of the FAA received 52 intelligence summaries from their security branch that mentioned Bin Laden or Al Qaeda between April 2001 and Sept. 10 of that year. That represented nearly half of all the intelligence summaries prepared by the security branch in that period, the report said. Five of the reports specifically mentioned Al Qaeda's training or capability to conduct hijackings, the report said. And two mentioned suicide operations, although not connected to an aviation threat, the report said. Federal aviation and natural security officials believed the threat was focused overseas, the report said, and the commission found no evidence that the FAA had specific intelligence indicating that Al Qaeda was plotting to hijack commercial planes within the United States and use them as weapons. But the FAA "had indeed considered the possibility that terrorists would hijack a plane and use it as a weapon," and it distributed a CD-ROM presentation to air carriers and airports that cited the possibility of a suicide attack. The agency conducted a series of classified briefings in mid-2001 for security officials at 19 of the nation's busiest airports to warn them about the threat posed in particular by Osama bin Laden, the commission report said. Previously, the commission's staff has reported that in its presentations in 2000 and 2001 the FAA "discounted the threat because, fortunately, we have no indication that any group is currently thinking in that direction." The new report said that federal aviation officials did not direct adequate resources or attention to what was acknowledged to be a "renewed interest in hijacking" by terrorists. "Throughout 2001, the senior leadership of the FAA was focused on congestion and delays within the system and the ever-present issue of safety, but they were not as focused on security," the report said. "The So-Called Evidence Is a Farce"
The media's spotlight on `foreknowledge' and so-called `FBI lapses' served to distract public attention from the broader issue of political deception. Not a word was mentioned concerning the role of the CIA, which throughout the entire post-Cold War era, has aided and abetted Osama bin Laden's Al Qaeda, as part of its covert operations. "Of course they knew! The foreknowledge issue is a red herring. The `Islamic Brigades' are a creation of the CIA. In standard CIA jargon, Al Qaeda is categorized as an `intelligence asset.' Support to terrorist organizations is an integral part of U.S. foreign policy. Al Qaeda continues to this date (2002) to participate in CIA covert operations in different parts of the World. These `CIA-Osama links' do not belong to a bygone era, as suggested by the mainstream media. . . .
"The CIA keeps track of its `intelligence assets'. Amply documented, Osama bin Laden's whereabouts were always known. Al Qaeda is infiltrated by the CIA. In other words, there were no `intelligence failures'! In the nature of a well-led intelligence operation, the `intelligence asset' operates (wittingly or unwittingly) with some degree of autonomy, in relation to its U.S. government sponsors, but ultimately it acts consistently, in the interests of Uncle Sam. "While individual FBI agents are often unaware of the CIA's role, the relationship between the CIA and Al Qaeda is known at the top levels of the FBI. Members of the Bush Administration and the U.S. Congress are fully cognizant of these links. "The foreknowledge issue focussing on `FBI lapses' is an obvious smokescreen. While the whistleblowers serve to underscore the weaknesses of the FBI, the role of successive U.S. administrations (since the presidency of Jimmy Carter) in support of the `Islamic Militant Base', is simply not mentioned. "On July 5 of last year, a month and a day before President Bush first heard that al Qaeda might plan a hijacking, the White House summoned officials of a dozen federal agencies to the Situation Room. 'Something really spectacular is going to happen here, and it's going to happen soon,' the government's top counterterrorism official, Richard Clarke, told the assembled group, according to two of those present. The group included the Federal Aviation Administration, along with the Coast Guard, FBI, Secret Service and Immigration and Naturalization Service...."
"The government source said the [British] Prime Minister was always instantly contactable under the special communications system wherever he was, at home or overseas. An RAF source said that even if an airliner was hijacked at Heathrow and then turned east towards London, there would still be time to act...."
"my nephew Jim Pierce narrowly escaped injury or possible death. He was scheduled to attend a meeting on the 102nd floor of the South Tower, which was the second building hit. However, the night before, the meeting was moved to an adjacent building because the group had outgrown the conference room." President Bush's cousin should have been in the World Trade Centre when it was attacked. Jim Pierce, managing director of AON Corporations, had arranged a business conference on the 105th floor of the South Tower where its New York offices were based. But his group was too large so they decided to move across the street to the Millennium Hotel. Two hundred AON staff are missing. Mr Pierce told Houston, Texas TV station KPRC-TV he saw the explosion from the hotel. "It might as well have been a nuclear explosion," he claims. "They were gone in a second. It was a huge fireball that came down and then back up. It was just raining metal and debris. We knew immediately that it was right below our offices." He adds: "There's no doubt in my mind that people I walked past on my way out of there did not make it." Mr Pierce says he was concerned for the safety of his first cousin's family. "These evil people would stop at nothing and what better way to go after the President than to attack his offspring?" he said. Mr Pierce has been in contact with former President George Bush and former first lady, Barbara Bush. He said the first family was being strong and he was incredibly proud of his cousin. "The White House said tonight that President Bush had been warned by American intelligence agencies in early August that Osama bin Laden was seeking to hijack aircraft..."
"President Bush's daily intelligence briefings in the weeks leading up to the September 11 terror attacks included a warning of the possibility that Osama bin Laden's al Qaeda network would attempt to hijack a U.S.-based airliner, senior administration officials said Wednesday." "George Bush received specific warnings in the weeks before 11 September that an attack inside the United States was being planned by Osama bin Laden's al-Qaeda network, US government sources said yesterday…. The memo received by Bush on 6 August contained unconfirmed information passed on by British intelligence in 1998 revealing that al-Qaeda operatives had discussed hijacking a plane to negotiate the release of Sheikh Omar Abdel Rahman, the Muslim cleric imprisoned in America for his part in a plot to blow up the World Trade Centre in 1993." "Britain gave President Bush a categorical warning to expect multiple airline hijackings by the al-Qaeda network a month before the September 11 attacks which killed nearly 3000 people and triggered the international war against terrorism." "The U.S. government had received repeated warnings of impending attacks—and attacks using planes directed at New York and Washington—for several years. The government never told us about what it knew was coming." "...the briefing given to the president a month before the suicide hijackings included recent intelligence that al-Qaida was planning to send operatives to the United States to carry out an attack using high explosives." A: "The overwhelming bulk of the evidence was that this was an attack that was likely to take place overseas." - White House National Security Adviser Condoleezza Rice, in a May 16 news briefing. B: "Bin Laden Determined to Strike in U.S."
- Title of the CIA's Aug. 6 briefing memo to President Bush . . .
For Mayor Willie Brown, the first signs that something was amiss came late Monday when he got a call from what he described as his airport security - - a full eight hours before yesterday's string of terrorist attacks -- advising him that Americans should be cautious about their air travel. "Based on the potential massive damage to life and property that may result from an act of terrorism at a Florida port, the necessity to protect life and property from such acts of terrorism..."
"In response to inquiries from CBS News over why Ashcroft was traveling exclusively by leased jet aircraft instead of commercial airlines, the Justice Department cited what it called a "threat assessment" by the FBI, and said Ashcroft has been advised to travel only by private jet for the remainder of his term." "Weeks before the terrorist attacks on 11 September, the United States and the United Nations ignored warnings from a secret Taliban emissary that Osama bin Laden was planning a huge attack on American soil." "Egyptian intelligence warned American officials about a week before Sept. 11 that Osama bin Laden's network was in the advance stages of executing a significant operation against an American target, President Hosni Mubarak said in an interview on Sunday." "A key point in unraveling why the FBI failed to follow up leads on Al Qaeda terrorism now centers on the Bureau's contemptuously brushing aside warnings from French intelligence a few days before 9-11." "When the hubbub about what the White House did or didn't know before Sept. 11 dies down, Congressional or other investigators should consider the specific warnings that friendly Arab intelligence services sent to Washington in the summer of 2001." Israeli intelligence officials say that they warned their counterparts in the United States last month that large-scale terrorist attacks on highly visible targets on the American mainland were imminent." "A Minnesota FBI agent investigating Zacarias Moussaoui testified yesterday that he notified the Secret Service weeks before Sept. 11 that a terror team might hijack a plane and 'hit the nation's capital.'" "An FBI supervisor, sounding a prophetic pre-Sept. 11 alarm, warned FBI headquarters that student pilot Zacarias Moussaoui was so dangerous he might 'take control of a plane and fly it into the World Trade Center,' a congressional investigator said in a report Tuesday." "American intelligence received many more clues before the 11 September attacks than previously disclosed, that terrorists might hijack planes and turn them into weapons, a joint congressional committee was told yesterday." "U.S. intelligence agencies received many more indications than previously disclosed that Osama bin Laden's terrorist network was planning imminent "spectacular" attacks in the summer of 2001 aimed at inflicting mass casualties." "U.S. intelligence agencies picked up threats of attacks inside the United States and of using airplanes as weapons during the spring and summer before last year's Sept. 11 attacks, but were more focused on the possibility of an assault overseas, a congressional source said on Tuesday." "Patrick Tyler of the New York Times is reporting from Washington: 'In the first days after the attacks on Sept. 11, the Saudi Arabian ambasador to Washington, Prince Bandar ibn Sultan, supervised the urgent evacuation of 24 members of Osama bin Laden's extended family from the United States fearing they might be subjected to violence.'" "US special agents were told to back off the bin Laden family and the Saudi royals soon after George Bush became president, although that has all changed since September 11, it was reported today." "Odigo, the instant messaging service, says that two of its workers received messages two hours before the Twin Towers attack on September 11 predicting the attack would happen, and the company has been cooperating with Israeli and American law enforcement, including the FBI, in trying to find the original sender of the message predicting the attack." "The hastily arranged flight out of Raytheon Airport Services, a private hangar on the outskirts of Tampa International Airport, was anything but ordinary. It lifted off the tarmac at a time when every private plane in the nation was grounded due to safety concerns after the Sept. 11 attacks. " UK Minister: "Bush had Foreknowledge of 9-11 attacks"
"...it is not surprising that some have seen the US failure to avert the 9/11 attacks as creating an invaluable pretext for attacking Afghanistan in a war that had clearly already been well planned in advance." The FBI had an informant in the group that committted the 1993 attack. The informant told the government about the plans in advance, and asked for permission to interfere with the attack by ensuring that the bomb wouldn't work. The informant was told not to interfere. "Tapes Depict Proposal to Thwart Bomb Used in Trade Center Blast"
The largest US covert operation (at least before 9-11) armed the Mujaheddin during the Soviet - Afghan war. Pakistan was used to funnel weapons, even while Pakistan developed its nuclear program. One theory about 9-11 is that it was "blowback" - an unintended consequence of US foreign policy in Afghanistan. (The largest foreign CIA operation ever was the arming of the Mujaheddin during the Soviet-Afghan war - while Pakistan developed its nuclear weapons program.) However, "blowback" does not explain why fighter planes were not sent up to intercept the hijacked airplanes until it was too late.